Rumors about the LSAT experimental section are legion, and facts are difficult to come by. In the discussion below, we dissect the experimental section in detail. What is the experimental section and why is it on the test? Each LSAT contains five sections, but only four sections are scored. The extra, unscored section is known as the variable section or experimental section. According to LSAC, this section is used to "pretest new test items and to preequate new test forms." 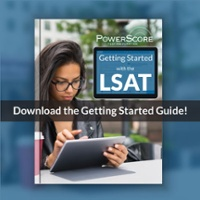 In other words, the experimental section contains items that will appear on future LSATs, and the results of your performance are used to determine future scoring scales (for related information on the LSAT Scoring Scale, please click here). Although the experimental section has no direct impact on your score, your performance on this section is carefully analyzed by LSAC. Sophisticated statistical analyses are performed on your answers, and these results, when combined with information from thousands of other test takers, present a clear picture of the difficulty and logical validity of each question. Then, when future tests are assembled, questions can be selected with a high degree of confidence in how test takers will perform. Thus, entire tests can be assembled with a very accurate understanding of how many questions a 170-level scorer would miss, how many questions a 160-level scorer would miss, etc. With this information, scoring scales can largely be determined even before a test has been administered. Where does the experimental section appear? Up until the June 2007 LSAT, the experimental section number was the same for every test taker (for example, on the December 2006 LSAT every test taker in the country had section 1 as their experimental). From June 2007 to June 2011, LSAC began using test forms that gave different experimental section numbers to different students, but with the limitation that the experimental section was always one of the first three sections. Thus, on a given test administration, some test takers might have section 2 as their experimental whereas other examinees might have section 1 or section 3 as their experimental. Starting in October 2011, LSAC continued the practice of using test forms that gave different experimental section numbers to different students, but they removed the limitation that the experimental section must be among the first three sections, and allowed the experimental to appear among the final two sections. For example, some October 2011 test takers had scored sections 1, 2, 3, and 5, and had the experimental as section 4. What this means is that there is no longer a reliable way for individual test takers to predict or determine their experimental section number. It is possible to narrow it down to two (if Games or Reading Comprehension is experimental) or three sections (if Logical Reasoning is experimental), but with the test makers potentially placing the experimental section as any of the five it is essentially impossible to determine the specific section that is unscored. Does everyone have the same experimental section content? Note that each test taker has the same scored test components: two sections of Logical Reasoning, one section of Logic Games, and one section of Reading Comprehension. Each of these sections is identical for all test takers, e.g. everyone has the same set of Logic Games, the same Reading Comprehension passages, etc. But, each test taker does not have the sections in the same order, nor do they necessarily have the same experimental section topic. The variation in test order is randomly assigned, and thus the order of the test is not matched to you personally—it is simply luck of the draw. The same is true for your experimental section topic, although if you get an experimental section that is one of your weaknesses (for example, two game sections), that can be a powerful psychological negative during the test. Can I predict which section is the experimental prior to the test? As discussed above, you cannot predict which section will be the experimental before the test. Should I try to figure out the experimental while I am doing the test? No. Although some test takers can determine which section was experimental after the fact (as discussed below), this information is only useful for deciding whether to cancel your score once the test is over. During the test you should focus on performing well on each section without regard for the experimental. There is a myth that the scored sections of every LSAT must add up to 101 questions. The story goes that you can add up the questions during the test, and then throw out the extra section that would cause the question count to add to anything but 101 questions. While many LSATs do add up to 101 questions, the problem with this method is that there have been a large number of exceptions to the “rule.” For example, a substantial number of recent LSATs each originally contained 100 questions, and one LSAT even contained 102 questions. Because there is always the possibility that an LSAT can contain a fewer or greater number of questions than 101, the “question counting” method is not foolproof. Some people claim that they can spot the experimental because the questions are unusual in nature, or that the section seemed especially hard or easy. This is an imprecise method for determining the experimental section. First, the LSAT is not comprised of sections of identical difficulty, but rather of a set of sections that are supposed to add up to the same overall difficulty every time. Within each exam the difficulty of individual sections tends to vary; for example, on some LSATs the Reading Comprehension section is very challenging whereas on other exams the Reading Comprehension section is fairly easy. The same is true for the other sections. While taking a demanding test, you would be hard pressed to make a fast, accurate assessment that a section is too hard or too easy to be scored. Second, during the heat of the test, questions that are very typical can appear to be unusual. For example, we have heard students comment after a test that the Games section contained a completely new type of game. Yet, after they assessed the test later, the same students realized that the game in question was simply a variation of an old standard. The game just appeared unusual and difficult while they were under the pressure of the exam. How do I figure out the experimental section after the test? Analysis: one of the two Logic Games sections must be the experimental. Analysis: one of the two Reading Comprehension sections must be the experimental. Analysis: Section 1, 3, or 5 is the experimental section. Analysis: Section 2 or 4 is the experimental section. Analysis: Section 2 or 3 is the experimental section. Analysis: Section 1 or 4 is the experimental section. Clearly, test takers B, C, and D have a decided advantage as they complete their tests because there are only two possibilities for the experimental section placement, Test taker A is slightly disadvantaged because any of three sections could be the experimental. If the experimental is unscored, why should I worry about it at all? 1. If you run into trouble on one of the sections. Test takers can get very discouraged by a poor performance early in the test. But, because there is an experimental, if you have a poor performance on a section, during the remainder of the test simply assume that the section was experimental and do not let that performance negatively affect the rest of your test performance. Then, at the conclusion of the exam you can attempt to determine if that section was in fact the experimental. 2. If you are thinking about cancelling your score. The decision to cancel your score can be very difficult, and every piece of information helps make the decision easier. Sometimes, knowing the experimental section can finalize your decision to cancel or not to cancel. For some students, the experimental section number is irrelevant. They work through the test, are comfortable with their performance, and they do not need further information about the test. For other students, especially those considering cancelling their score, determining the experimental can be critical. The truth is that every LSAT is more or less the same. That's true in terms of content, structure, and difficulty with respect to final score. The decision to take a preparation course for the LSAT is often a difficult one for potential test takers.